Too much to do and not enough time. Does anyone else feel that way?? My dad and my husband say my mom and I lie awake at night thinking of projects to do, and they are absolutely right. We just don't have time to do them all. 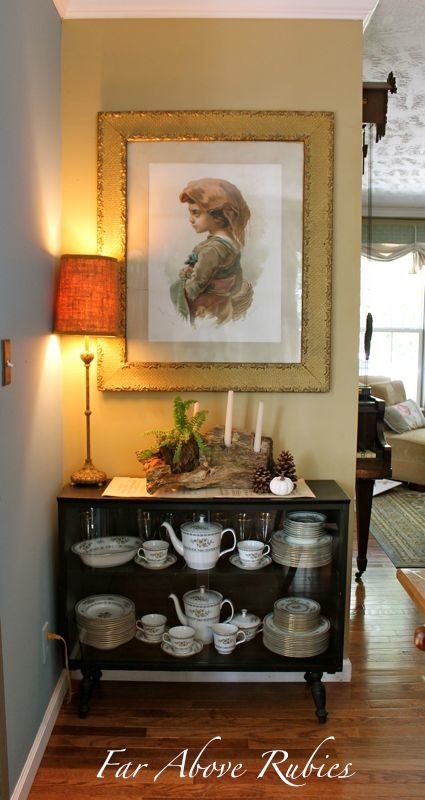 Here is a little repurpose I did on a china cabinet my grandmother gave me years ago. It started out dark wood then I painted it white in the 1990s (imagine that) then it was red before getting a coat of black several years ago. It also started out with sliding glass doors. Here is this little corner in the dining room last summer after I painted this room. I had just filled it with some of the Minton "Avignon" china my mom passed down to us us after our wedding. It wasn't really working for me though. So I took out the glass and decided to put some of the books my aunt gave us last summer in it so they are accessible to the kids. She had an amazing collection of year books, encyclopedias, etc., that my kids are absolutely fascinated with. Imagine that...just picking up a book to read and not needing electricity or the battery power of a modern electronic device. I'm really loving the mini-library look. I also put an old view master of my dad's on one of the stacks of books then noticed in the photos it was not there. Hmmm. Kids love view masters too apparently. The funny thing is we don't have any of the disks to go in it. Not sure what they are looking at. 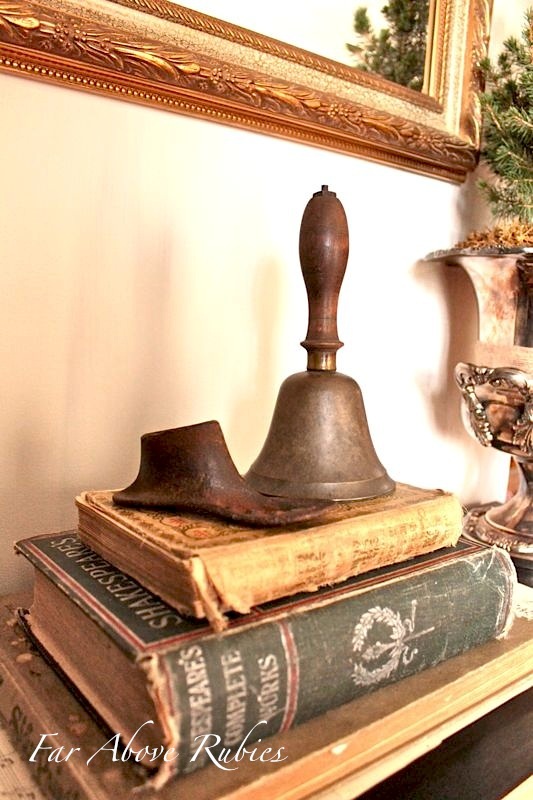 Some of my grandfather's old books, the bell he rang as a school teacher and an antique baby shoe last complete the vintage accessories. I love my little corner now and love that the kids can grab a book to look at and learn something. The other corner we are still working on. 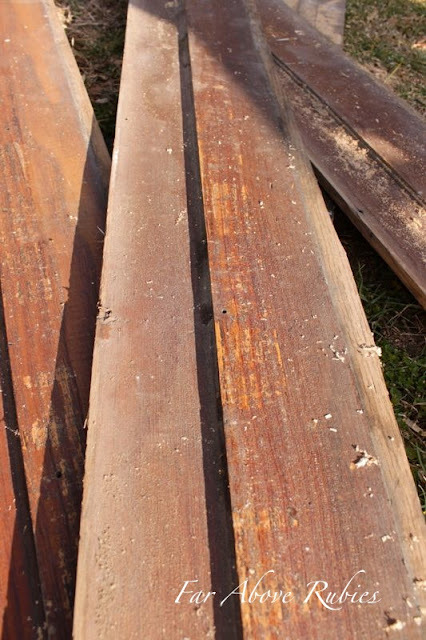 to make frames for the bottom set of doors. He is now in the woodshop *hopefully* putting them together. Like I said...not enough time! Thanks for stopping by! Please come by and join me on facebook because we really are having fun and lots more interaction over there. Love that library spot-isn't it great to see your children's interest in real books? Love the update & how you styled it. 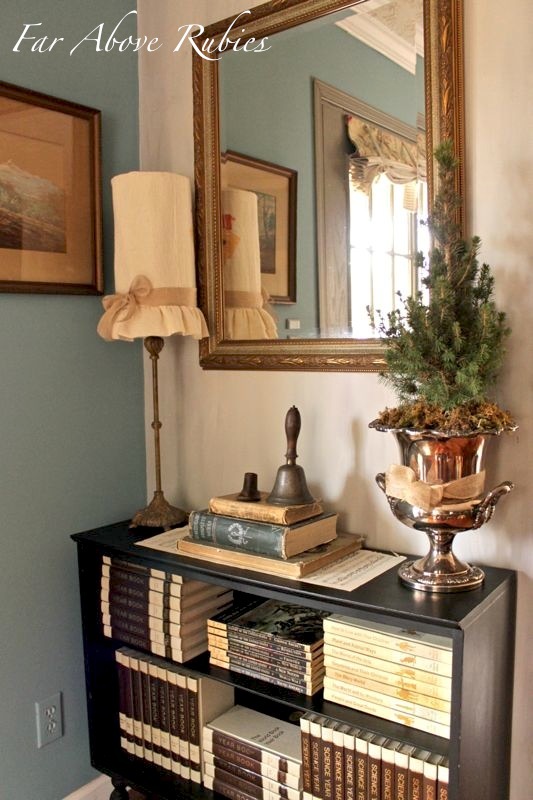 I love to decorate w/ books. And I agree...I am another person up at night thinking of all the great projects I want to accomplish. Great little corner. I love the fact you used family pieces. Your Dad's bell is priceless! My parents were both teachers but not bell? I love it and it's so much up my alley. I laughed at the comment about lying awake thinking of projects. My husband says the same thing, as did my father. I guess it's a genetic trait, yes? in a silver champagne bucket! You are so talented and it is wonderful that you still cherish the pieces from family from days gone by. There is nothing like the feel, smell and tranquility of reading a "real" book or magazine. Modern conveniences and electronics are good, but I do so hope we never lose paper and print. What a sad time that would be! Love it Anita! You always accessorize so beautifully! I love to have pieces that I keep reinventing like your pretty book cabinet!Great choice to paint it black. I love a little black in each room... it gives weight to a room. Your little glassless bookcase is perfectly at home in your dining room. Being a former teacher I love the bell! I love your cabinet, your encyclopedias, and the vignette on top. My parents gave us the set of World Book encyclopedias we had growing up (including the year books), and they're on bookshelves in our son's room. Sadly, he never really looked at them a lot, but I loved looking at them growing up, and I still occasionally get one out if I want to look up some information. I think they're a real treasure. P.S. I published Part Three of our England trip last week (Stratford-on-Avon), if you're interested in seeing it. Looks great Anita!! I can totally rate to lying awake making my lists, etc. Can never go back to sleep when I wake up early because of it!! 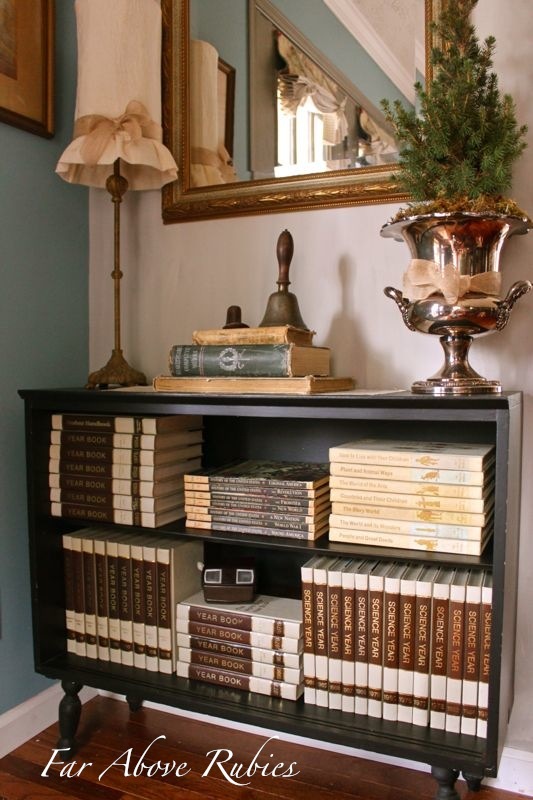 I like the china cabinet re-purposed for books. Very nicely accessorized. Your husband is so talented. 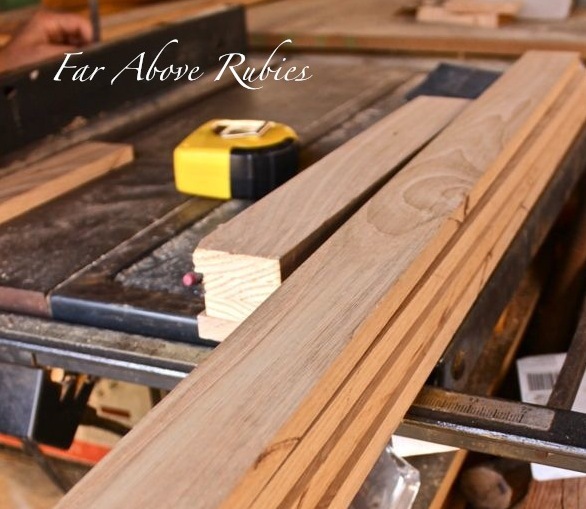 Can';t wait to see what the corner cabinet looks like with the doors. 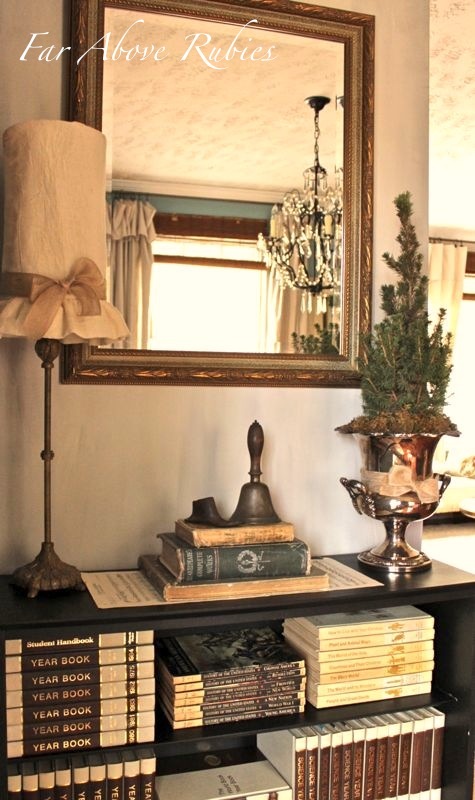 The way you have staged the bookshelf is perfect! The photos are gorgeous and I like that you used things that are meaningful to you. You did a really lovely job. 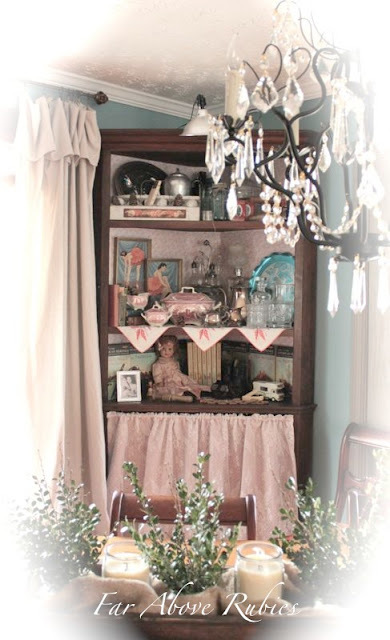 Such a pretty piece Anita, and I love the pretty vignette you created on top!! Fantastic Anita. WOW you sure are making some awesome changes around your home. Feels so fresh and full of stories too. Anita, I just enjoy popping in to see what you've done! You always have the greatest pieces. My grandmother had a dark wood cabinet, very similar to that one, with sliding glass doors. And guess what was in it? Books and encyclopedias!! 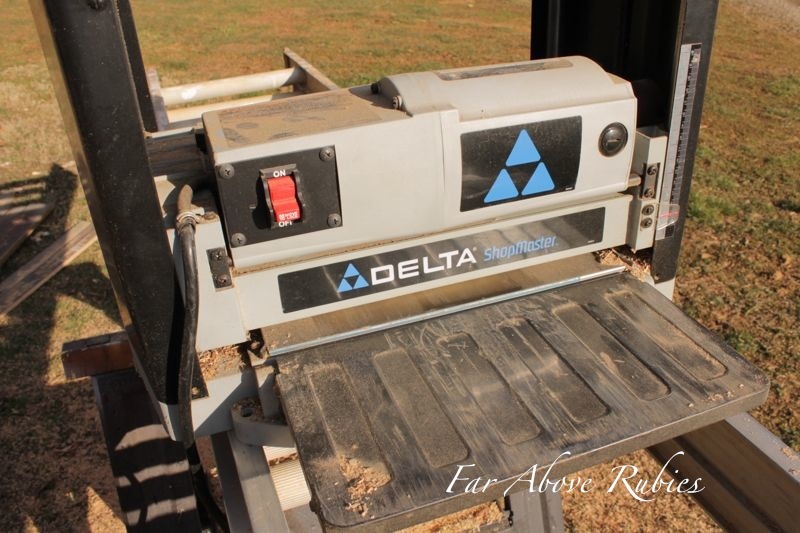 It's so nice to hear of others who also have ongoing projects that last quite a while too. LOL! Your little corner area project turned out beautifully though. Love that bookcase in black. My encyclopedias are sitting in the basement now and I'm trying to figure out the best place to donate them. Have a great day! Fabulous that the kids love to look at books! Great job! Anita, your home is looking prettier every post, photo. Love old bookshelves also, love the colors, lamp and your kids using old books....I still read my grandmother's home economic book with recipes, advice, etc., these treasures are priceless.Your color scheme is so beautiful, very European...., thank you. Love the pine tree in the silver! looks so great! I love this idea. The color combination in the room is just perfect. You did a really great job! 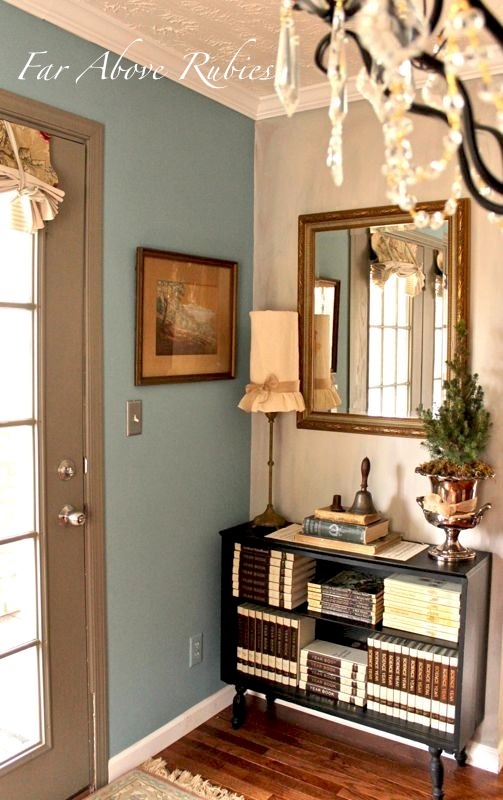 Love your little reading corner. The vignette on top is perfect and I enjoy thinking about your children enjoying those wonderful, old books that are filled with so many things. Have you ever done - or you think about doing - a feature on your roman shades? I have some windows that need something similar and I'd love to know more about yours and how you put them together and installed them. You know - everything!